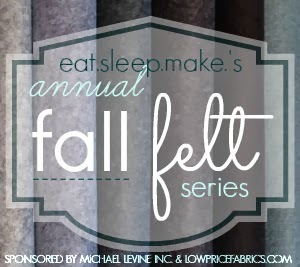 Welcome to the first day of our annual Fall Felt Series! We had such a fun time last year sharing our felt projects that we wanted to do it again this year and, thanks to the wonderful folks of Michael Levine and www.LowPriceFabric.com for providing the felt for the series, we get to show off some their beautiful felt in the process. So why hold a felt series anyway? Well, felt has many different uses, and it's not just for making stuffed animals and play food. Felt comes in a ton of beautiful colors, it's inexpensive, and it doesn't fray - and that means less edges to finish, which we are all for. 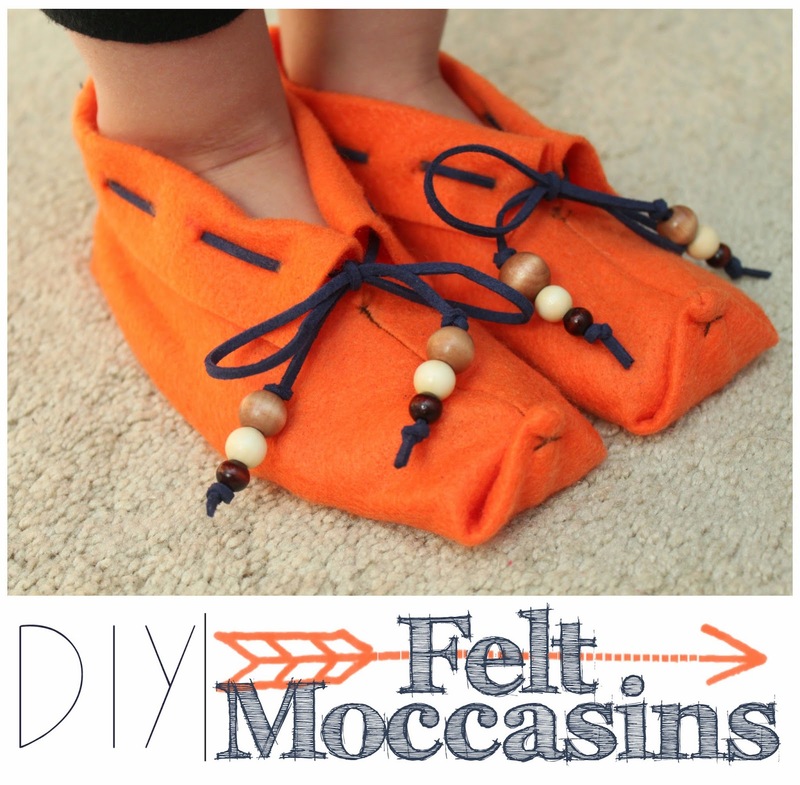 For our first felt project of the series, I wanted to make a pair of felt moccasin slippers. Felt lends itself perfectly to a project like this because it holds its structure well, and it's nice and warm for little (or big!) feet. 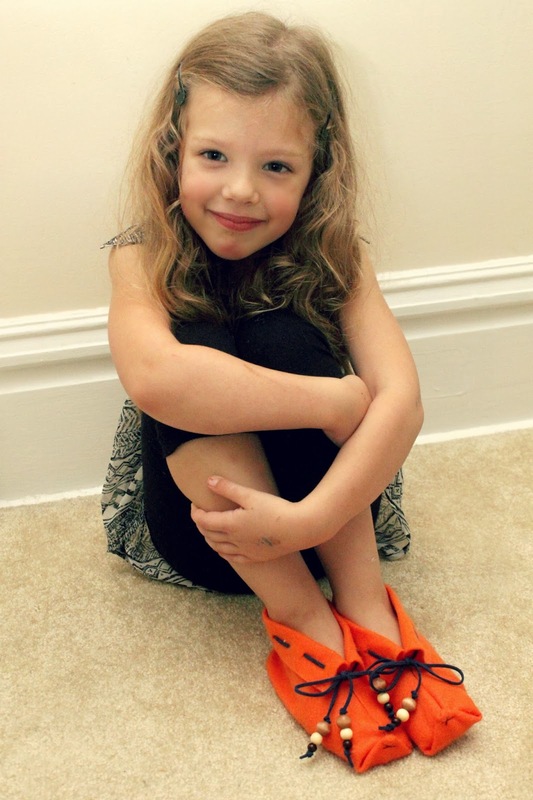 I'll walk you through a quick tutorial on making your own pattern for these slippers, or if you happen to have a child who wears a size 11, today's your lucky day because I'm offering a free downloadable pattern found HERE! 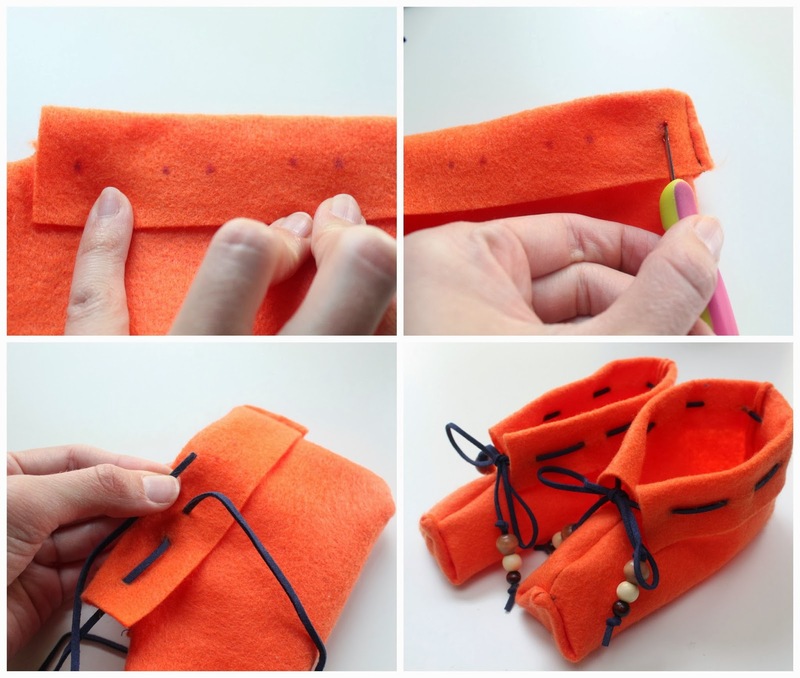 SUPPLIES: orange felt (I used Michael Levine's Rainbow Recycled Classic felt in Orange found HERE), suede cording, small wooden beads, disappearing ink marker, needle and thread, seam ripper, sewing machine and basic sewing supplies. Drafting the pattern for these moccasins was pretty simple. First, I traced around my daughter's foot on freezer paper and added 1/2 inch seam allowance and cut the pattern out. Then, I placed the pattern onto a piece of felt, and drew around the slipper in the pattern you see above. The distance from the toe of my pattern to the top of the felt was 1 inch, then around the top sides are 1 1/2 inches. The side "flaps" you see extend 3 3/4 inches from the pattern on each side, and the heel of the pattern to the edge of the felt is 1/2 inch. When in doubt, cut your pieces larger than you think you'll need because you can always trim them down later. Cut two slippers out of felt. 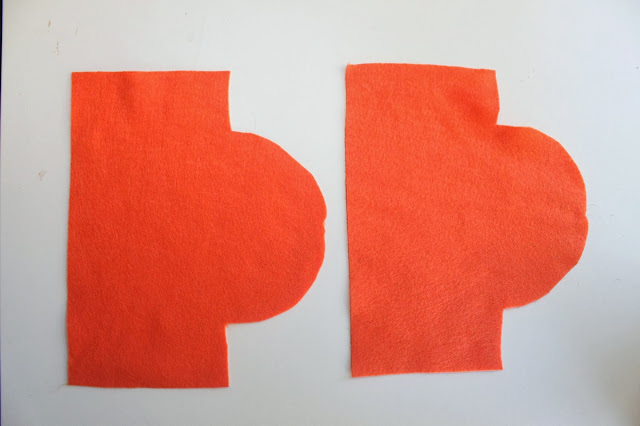 If you're using my pattern in a child's size 11, print it out and cut your two pattern pieces. TWO: sew the pinned areas only. THREE: now we are going to box the heels of the slippers. With the shoe still inside out, fold the heel so that the seam is down the middle. Pin. FOUR: sew a line about 1/2 inch from the edge and snip the excess. FIVE: turn your slipper right side out, and you should have a nice boxed heel! SIX: Fold the flaps down. We are now going to make a small fold on the toe portion of each slipper. 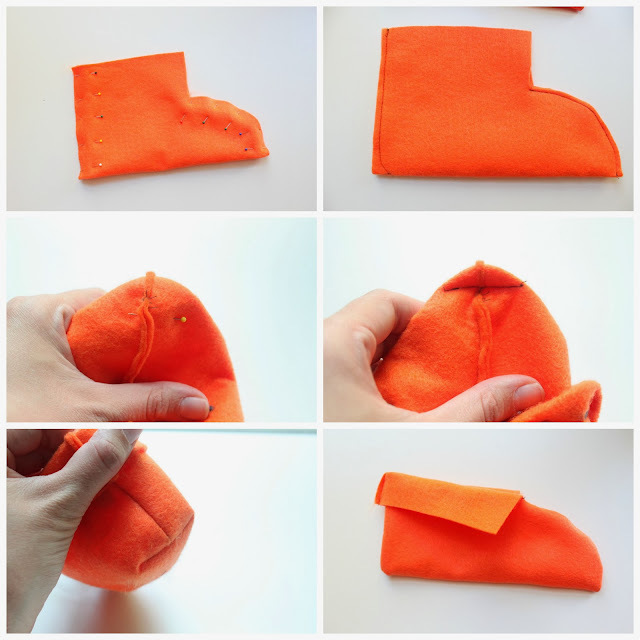 ONE: fold the toe of each slipper up 1 inch so the tip lines up with the center seam. TWO: use a needle and thread to make an X at the top, securing the toe. I doubled my thread and sewed over the X 3-4 times each to make sure it was secure. ONE: use your disappearing ink marker to make marks where you will be threading your suede. I started 1/2 inch from the edge and marked every inch and 1/2 inch. THREE: cut 2 pieces of suede cording (mine were each 29 inches) and lace them through the slits you made in your felt. FOUR: finally, tie a bow in your cording and string on some wood beads. Knot on the ends to secure. Now you have some adorable (and warm!) felt slippers! If you're worried about your child slipping, you could always use some puff paint to make lines on the bottom of the slippers to add grip. I think I'm going to have to make myself a pair. Maybe in suede? We'll be back tomorrow and throughout the week with more great felt projects! These are awesome Jen!!! Wow, I love them!! !